I have been doing a lot of research lately on how to clean my house efficiently and quickly and not seem like I am always cleaning. There are many solutions out there, but nothing that suited my exact needs, so I made my own that I am going to share with you today. Firstly, let me set some boundaries so you know where I am coming from. I live with my husband, kids are grown and gone. Our house is a split level, so 1 story on half the house and 2 stories on the other. It has 3 bedrooms but we only use 1 of them as a bedroom. The other bedrooms are our individual dressing rooms – the beauty of not having kids at home anymore! It has a full bath on the bedroom level and a half bath off the laundry. It has 2 other rooms downstairs, my very large craft room/study and my husband’s (much smaller) man cave/train room. The living/dining/kitchen is one space and is not that big. I did not include washing. I do my own and the household washing and my husband does his own. Washing really doesn’t take much time to do, I do a load every few days. I decided to do a schedule covering 5 weeks, or 35 days as I found those that went for less that that much time seemed very rushed. I set myself 30 mins each day to clean. Set the timer and only work for 30 mins. If you can’t achieve what you want in this much time then you are either going too slowly, worrying too much about it or you have set yourself too much to do, so fix your schedule. 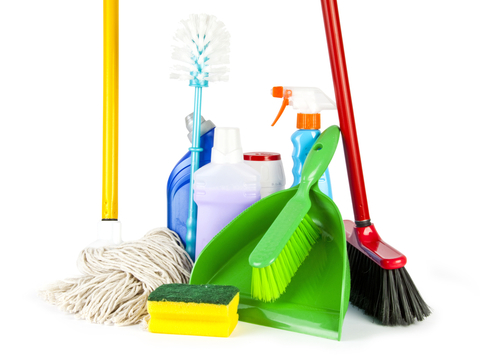 Over the 5 week period, do a deep clean of each room once and do surface cleans of them during the other weeks. I work on a 9 day rotating schedule, so each thing gets done every 9 days. Yes, this is a little more than a week between cleans for the rooms, but honestly, who cares! The place looks clean and tidy all the time. Here are the things I do each 9 days, spaced out over the 5 weeks, meaning I do them 3-4 times during the 5 weeks. And the things I fit in elsewhere in the schedule one day during the schedule, so they get done once every 5 weeks. I hope you find my tips useful. I love comments, so let me know how you go with your cleaning schedule.